Well, that was not as difficult as I thought it would be. 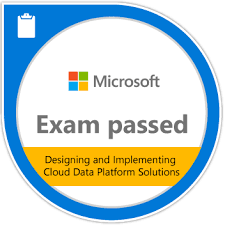 I was able to pass the 70-473 exam for the Cloud Data Platform Specialist certification. The first place to start if you are interested in passing this exam is Microsoft Virtual Academy. It has a great overview of the exam topics with some demonstrations. Next, spend some time with the Azure Documentation to walk through some very excellent tutorials. Be the first to comment on "Exam Passed – 473"